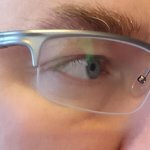 I purchased the silver frames with the orange tips to use with my VDU lens as these frames offer a wide field of view, with large lens wrapping around more than most glasses. They look very good and are very solidly made, but don't feel heavy when wearing them. The arms grip well without being uncomfortable. I think the wide field of view and the grippy arms would make these ideal for use as sports glasses as well. Was a bit concerned ordering online for my glasses for the first time but need not have worried. They are perfect and fantastic value for money. Will be ordering again soon ! Amazing glasses. Comfortable and stylish with wide field of view. Good quality and durable. Easy to order. Fast service. Very light to wear.